It is a sad postcard - the cinema La Clef in Paris was closed in April 2018. 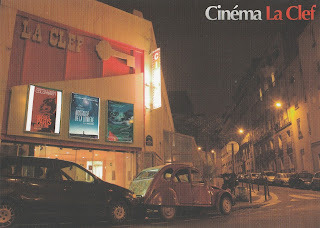 The Clef was part of the network of independent Parisian Cinemas (CIP), composed of the Grand Action, Max Linder, Ursulines, etc. - many places of cinema that contribute to make Paris the film capital of the world. The cinema was opened in the 1969 with three halls with 226, 83 and 81 seats. The name and sign La Clef - The Key comes from the locatio at the intersection of rue Daubenton and rue de la Clef . A good name for a neighborhood cinema. Later the house had only two halls and was used for exhibitions and events. Look at salles-cinemas.com for more information and pictures.